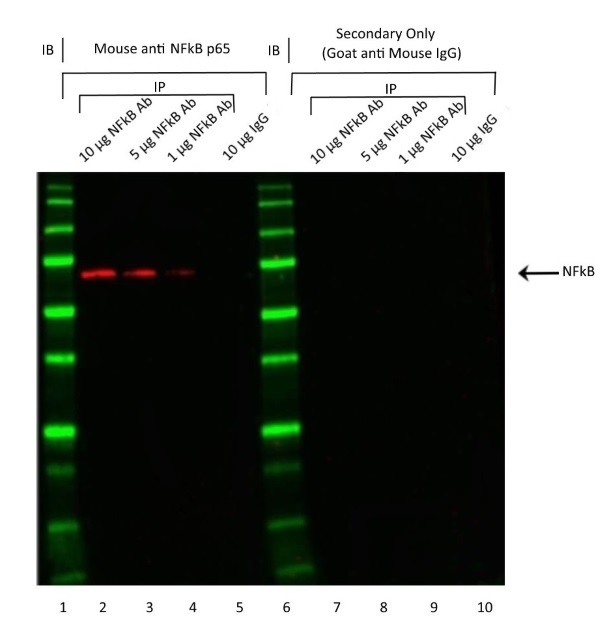 Western blot analysis of Jurkat cell lysate probed with Mouse anti NFkB (p65) antibody, clone 2A12A7 (MCA6021). Western blot analysis of NFkB IP samples. IP was performed on Jurkat cell lysates using 10 µg (lanes 2 & 7), 5 µg (lanes 3 & 8), 1 µg (lanes 4 & 9) Sheep anti NFkB p65 antibody ( AHP394), and 10 µg polyclonal IgG (lanes 5 & 10). 8.75 µl of each IP was loaded onto an AnykD ™ Criterion ™ TGX Stain-Free™ gel. Precision Plus Protein™ Prestained Standards were run lanes 1 & 6. (MCA6021) was used at 1/1000 in lanes 1-5. HRP conjugated Goat anti Mouse IgG (H/L) antibody (STAR117P) was used at 1/10,000 and visualized on the Bio-Rad Chemidoc™ Touch Imaging System. Arrow points to NFkB (molecular weight ~65 kDa). 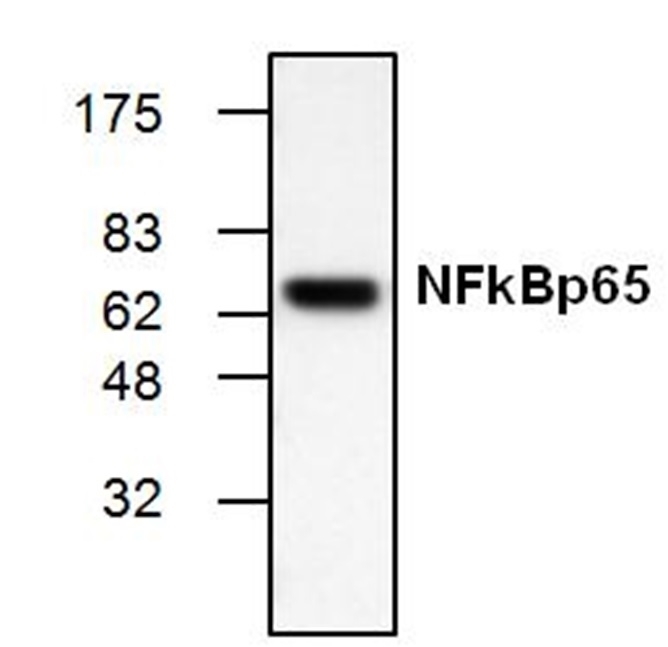 Mouse anti NFkB p65 antibody, clone 2A12A7 recognizes Nuclear factor NF-kappa-B p65 subunit also known as Nuclear factor of kappa light polypeptide gene enhancer in B-cells 3 or RelA. NF-kappa-B p105 and p100 subunits are large precursor proteins that are cleaved by the ubiquitin/proteasome pathway into the mature NF-kappa-B p50 and p52 subunits (NF-kappa-B p105 cleavage results in the p50 unit, while cleavage of NF-kappa-B p100 results in the p52 subunit). Rel protein family members interact with p52 and p50 to form transcription factors. In the absence of stimulation an I-kappa-B protein mediated sequestration mechanism ensures that the transcription factors remain in the cytoplasm. Upon stimulation, I-kappa-B proteins become phosphorylated, which results in their ubiquitylation and subsequent degradation by the 26S proteasome. The NF-kappa-B pathway plays a critical in mediating immune responses after infection and has been implicated in a variety of diseases ranging from autoimmune disorders to cancer.